An Arkansas community bank CEO was indicted on 11 counts of bank fraud in connection with a SBA disaster loan. John Stacks also owns Mountain Pure, a water bottling plant. After a tornado struck the area in 2008, the company received a $700,000 SBA disaster loan. The indictment says Stacks made false statements to SBA about equipment and property that were damaged. They also accuse him of lying to the SBA about a contract to sell bottled water to an international third party vendor. Last year, the plant was raided by federal agents, including agents from the IRS and SBA, searching for evidence of “economic crimes,” in connection with the SBA loan. Employees of the company have filed a lawsuit against the feds for how they were treated during the raid. John Stacks maintains his innocence. 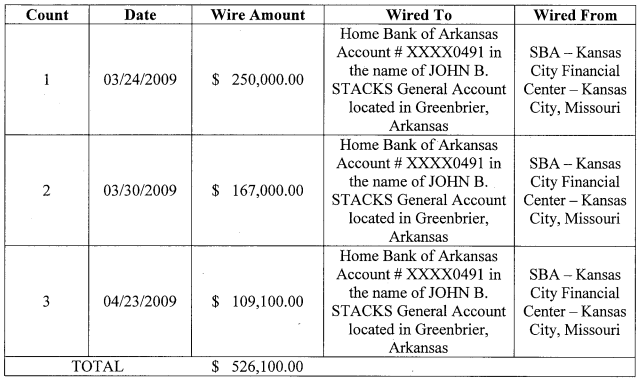 In an interview with Arkansas Business on March 22, Stacks said he had received a target letter from the U.S. Attorney’s Office a couple of weeks earlier. At that time, he said Mountain Pure had received “a clean bill of health” from the Internal Revenue Service and the SBA loan was not in arrears. “Even as we sit here today, we’ve never been a day late,” Stacks said in March.